The following text was contributed by the Government of Brazil. As one of OGP’s co-founders, Brazil is strongly committed to strengthening transparency of government actions, preventing and fighting corruption, fostering the democratic ideals with citizen participation in decision making and improving public services. Over the last 10 years, the country developed several initiatives to improve its legal framework, foster citizen participation and use technology for more openness. 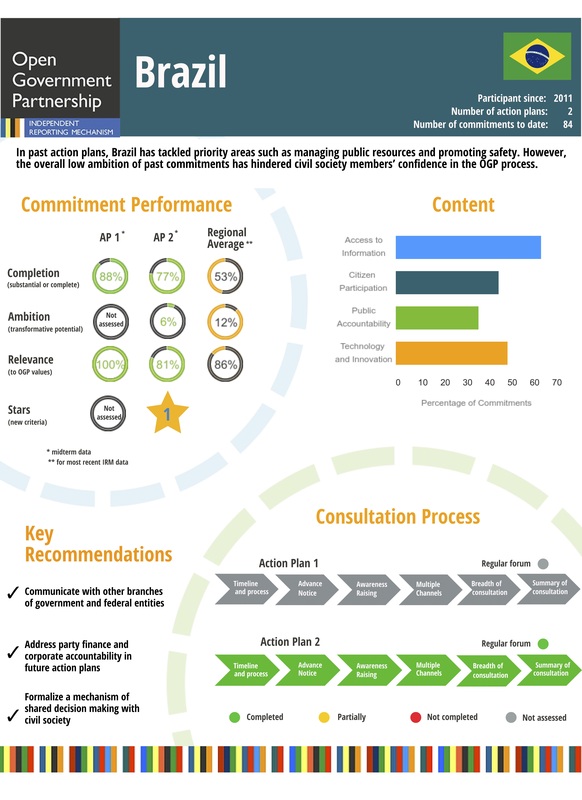 In its first Action Plan for OGP, Brazil undertook 32 commitments. These commitments produced many important benefits, such as the creation of the Open Data Portal, the organization of nationwide conference on transparency (CONSOCIAL) – which involved more than 100 000 citizens – and the implementation of the Brazilian Access to Information Law. Over 90% were those commitments were fully or partially implemented and the country also concluded 11 other open government initiatives that werenot originally part of the Action Plan. For its second plan, Brazil used a broader participation process, discussing actions with citizens in the Internet for over 2 months, and with a in-person meeting that invited more than 80 civil society organizations (CSOs) and government officials from several agencies to discuss open government action. As a result, the country developed a bolder action plan, with 52 commitments – 19 of those proposed by CSOs – and the involvement of 17 government bodies. The coordination of the Open Government Plan is organized by an Inter-Ministerial Committee on Open Government (CIGA).